What would you have left if you awoke and were told you would be paralyzed from the eyes down for the rest of your life? After an almost fatal car crash and a botched surgery to repair nerve damage, that was Clay Byars's reality at eighteen years old. Determination became the only constant in his life from that point on, and, miraculously, he quickly began to defy the odds. Clay discovered a life far different from that of his identical twin brother, Will. As Clay's life changed in an unimaginable way, Will's continued as a typical college freshmen with the world at his feet, providing not only a foil to Clay's inability to live a normal life but a sense of familiarity and connection to himself. As Will went on to graduate, marry, and start a family, Clay carved out a unique existence, doing the seemingly impossible by living on his own on a remote farm in Alabama. With haunting clarity in an eloquent yet unsentimental retelling, Clay shares the unlikely story of his life and his coping mechanisms, including weekly singing lessons that do more than teach him to use his voice again--they remind him of his will to exist. 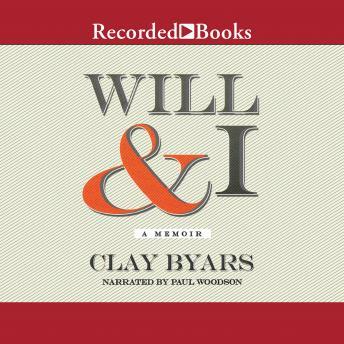 In Will & I, the most striking parts of the story are not the details of a tragedy but the piercing insights that decorate Clay's sparse, honest way of seeing the world and bravely challenging himself and his abilities at every turn.